If you are in need of a professional swift or skein-winderr, then you are in luck. Why? Because we have the comprehensive system available. We have the solutions for indie dyers. Our line of swifts and skein-winders is second to none! We offer both 2 and 4 yard swifts and skein-winders. We offer both manual and motorized units. We offer non-contact electronic meterized units. We offer single, double, and triple as well as high capacity Flexi-Skein yarn guide systems. We invented the Yarn Pet cone holder systems which eliminates re-twisting of your yarn. Our units have an integrated soft touch braking system which will not leave indentations in the aluminum arms regardless ouf how many thousands of times you adjust the skein size. Our Electronic Rotation Counter measures in yards, meters, and rotations. Our Motor control unit communicates with the meter and together they work to measure a precise amount of yarn and then turn themselves off. We thought our ball winder system was good! The swift and skein-winder product line is massive and is easily the most complete and the finest line in the market for commercial grade swifts and skein-winders. You can see from this picture of our swift, our unit is shaped like a Ferris Wheel. It is vertical and easy to walk up to. Loading and unloading is easy and you do not have to reach over the top like you do on a umbrella swift. We believe that while umbrella swifts are "neat" they are not heavy duty. They are basically heavy popsicle sticks connected by string. As we said, they are neat tools that play a key role in our industry. However, they do not hold up to the rigors of a yarn shop and they can be awkward to use. Our vertical orientation is a no-nonsense design. Our aluminum arms are strong yet lightweight. Our yarn guides (old style pictured) have an integrated braking system that allows the user to lock the position of the guide anywhere. They are infinitely adjustable along their 31" length. The entire unit can be easily rotated as well if you need to target it to some other place in your shop. 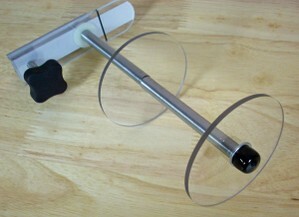 The table top version can be inserted into a floor stand version in a few seconds. 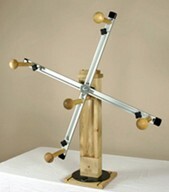 A motor drive can be added, as well as an electronic rotation counter (ERC). Everything is built around a core product and the user is never asked to abandon part of their system when they upgrade. The swift and the skein-winder are the same exact product mechanically. We simply put more features and options into the skein-winder. Without question, our product line is the most flexible and advanced available because of the way we assemble the various options around the core product. This gives our customers tremendous flexibility and expansion capabilities. Our new guide system is an improved system that is made of steel construction. It is superior to the original wooded guides that were first designed for the system.